Based on feedback I received from residents, I moved several motions directing the city to improve its response to residential infill construction sites and ensure that our neighbourhoods are protected and respected when undergoing development. In response, City staff developed a multi-faceted strategy to minimize the negative impacts of residential infill construction and streamline how the City deals with problem properties. As part of this strategy, Toronto Building has created an infill development website with information on how to be a good neighbour during the construction process and how the city effectively responds to and addresses complaints about construction sites. Furthermore, if you have concerns about a residential infill development in your neighbourhood, you are now able to find the contact information of the City’s building inspector online here. For more information on the City’s Residential Infill Development Strategy, please visit www.toronto.ca/infill. The Yonge and Eglinton neighbourhood is experiencing some of the most extreme intensification in the entire city – by 2030, between 24,000 and 28,000 new residents are expected to live in the area. The Ontario Municipal Board has continued to approve development after development without considering whether there is the infrastructure capacity to handle such a huge increase of development and the impacts to the existing community. The OMB-approved 35-storey building at 18-30 Erskine Avenue – right next to John Fisher Junior Public School – is the ultimate example of this irresponsible and narrow-focused provincial planning process. While I’m encouraged by the province’s recently announced reforms to the OMB, they’re unfortunately too late for already approved developments like the one at 18-30 Erskine and the overdevelopment of Yonge-Eglinton more generally. In the meantime, the city is developing a new planning framework – called Midtown in Focus – to improve parks, open space and streetscape in the Yonge-Eglinton neighbourhood. In 2015, I moved to expand the scope of Midtown in Focus to include a review of the performance and capacity of city infrastructure, including transit, transportation networks, community services, water and energy. Midtown in Focus will begin to come to fruition later this year when city staff bring forward draft recommendations for the updated Yonge Eglinton Secondary Plan. The new Secondary Plan is expected to be completed in mid-2018. In my first term, based on feedback from residents, I moved several motions urging the city to improve its response to residential infill construction sites and ensure that our neighbourhoods are protected and respected when undergoing development. In response, last year city staff developed a multi-faceted strategy to minimize the negative impacts of residential infill construction and streamline how the city deals with problem properties. Toronto Building is also in the midst of developing requirements for a new and improved notice that permit holders will be required to post on site. Be sure to check out toronto.ca/infill, which provides resources for residents, including a Good Neighbour Guide outlining requirements, best practices and communication tips to help everyone involved move smoothly through the project. Since I became your local Councillor in 2010, I’ve fought to transform our city’s local planning processes to make them more responsive to the needs and concerns of our city’s local neighbourhoods. Over the years, there have been significant obstacles in getting the city to establish its own Local Appeal Body, an independent decision-making body that will replace the Ontario Municipal Board in hearing appeals of Committee of Adjustment decisions on minor variance and consent applications. But after years of hard work, Toronto’s Local Appeal Body (TLAB) is finally up and running at 40 Orchard View Boulevard, in the heart of the Yonge-Eglinton neighbourhood! To learn more about the TLAB, including the hearing schedule and how to appeal a Committee of Adjustment decision, please click here. In my first term, based on what I was hearing from residents, I moved several motions urging the city to improve its response to residential infill construction sites and ensure that our neighbourhoods are protected and respected when undergoing development. Be sure to check out toronto.ca/infill, which provides great resources for residents, including a Good Neighbour Guide outlining requirements, best practices and communication tips to help everyone involved move smoothly through the project. Since I became your local Councillor in 2010, I’ve advocated for reforms to make the Committee of Adjustment more effective, accountable and transparent. While there is still a long way to go, I’m happy to let you know that a number of improvements have been announced recently. One of my goals has been to make the Committee of Adjustment more accessible and user-friendly, and I’m pleased to share that detailed information about minor variance and consent applications is now available through the Application Information Centre. This means that you can easily access all variance lists, site plans and supporting documents online. The city has also just announced the launch of the Committee of Adjustment’s Mediation Pilot Program. This free and voluntary program will allow neighbours to access professional assistance and avoid extensive – and expensive – appeals. The mediation sessions will be conducted by a neutral third-party mediator and a neutral, experienced professional planner with knowledge of the city’s planning policies and minor variance legislation. To learn more about the Mediation Pilot Program, click here. As you may know, in my first term I moved several successful motions requesting significant improvements to the Committee of Adjustment (CoA) in order to strengthen transparency and accountability. I’m please to let you know that City Planning is finally moving ahead with a number of these improvements. Earlier this year, city staff implemented my recommendation to record CoA hearings. In the coming months, they’ll also be mobilizing technology in other ways to reduce costs and waste. For example, the newly launched eServices portal requires digital submission of CoA applications – this means that information and decisions relating to active applications will be easily available online at the Application Information Centre on the city’s website. City Planning has also prepared a CoA brochure that will help residents navigate the processes and procedures of the Committee and more effectively engage in hearings. Moving forward, city staff will be conducting a full review of CoA processes in each district of Toronto to ensure a more consistent practice across the entire city. The Ontario Municipal Board (OMB) has had a significant impact on Ward 25 – from Yonge and Eglinton to Bayview Avenue and Don Mills, our neighbourhoods are under intense pressure because of the OMB. The OMB is a provincially appointed, quasi-judicial administrative tribunal that hears planning appeals from the municipal level. When an application is appealed to the OMB, it’s the OMB – not the City of Toronto – that decides whether to approve the application. The OMB Members that preside over cases are often not from Toronto and do not have the intimate knowledge and local context of our neighbourhoods that the city’s planning departments and local representatives have. Additionally, while many jurisdictions have planning appeal bodies, none have the same power and broad rights that the OMB does. The OMB has more extensive influence over local planning-related matters than any other provincial board in Canada. Since I became your local Councillor, nearly every major development in Ward 25 has been appealed to the OMB. This has resulted in over 3,800 residential units and 330 storeys being decided by the province, not the city. I’ve voted four times with City Council to remove Toronto from the jurisdiction of the OMB. Although the province has not yet acted on releasing Toronto from the OMB’s grasp, they’ve launched a review of the Board’s scope and effectiveness. Alternative dispute resolution and fewer hearings. The deadline for providing feedback is December 19, 2016. I also encourage you to attend the province’s OMB Town Hall in Toronto on November 15 at 6:00 p.m. at the Metro Toronto Convention Centre. To RSVP, please click here. Midtown in Focus is an innovative vision for the Yonge-Eglinton neighbourhood and includes planning principles to improve parks, open space and the streetscape. City Council approved Midtown in Focus with broad community support in 2014 following an extensive public consultation process. The plan aims to increase green space in the Yonge-Eglinton area and is a key component of the area’s livability moving forward. Unfortunately, since the passing of the Midtown in Focus plan, it has been appealed to the Ontario Municipal Board. The first pre-hearing for this appeal will be held on July 12. If you’re interested in getting involved in fighting this appeal, please don’t hesitate to contact my office. 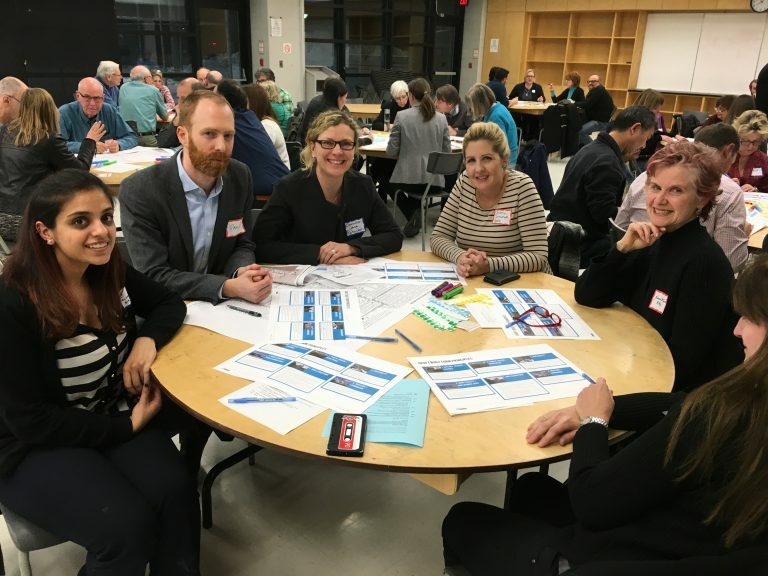 Brainstorming with residents, city staff and neighbouring Councillor Christin Carmichael Greb at the latest Midtown Planning Group meeting. Committee of Adjustment meetings are now being recorded! In my first term, I directed staff to consider the feasibility of recording Committee of Adjustment panels to improve transparency and accountability. In November 2015, city staff brought forward a positive report recommending the purchase and installation of a storage and recording device. The device has now been installed and tested at City Hall, and audio-visual recording of all Committee of Adjustment meetings began on May 1, 2016. Staff also reported this month that live streaming of the panels will be possible as of July 1, 2016 – this means that you can follow the meetings right from your own home! You can read the full report to the May meeting of the Planning & Growth Management Committee here. Residential infill construction activity in Toronto has more than doubled between 2010 and 2015 – and 33% of this construction is happening in Ward 25 and the two neighbouring Wards. Last term, I moved several motions at the Planning & Growth Management Committee – directly based on what I was hearing from local residents – to improve and streamline the city’s response to problem residential infill construction sites. It’s high time that contractors start playing by the rules and that residents have easy access to information that will help them better navigate what’s happening in their neighbourhoods. Staff’s recommendations also provide timelines for the roll out of each recommendation – in my mind, this improves transparency and holds the city accountable. You can read staff’s full report by clicking here. In early 2017, Municipal Licensing & Standards will provide recommendations on dust control measures, including the enactment of a bylaw regulating dust from construction activities. Improvements to the Committee of Adjustment are on the way! A public participation strategy to ensure the public is well-informed about the process and has the tools to effectively engage in Committee of Adjustment hearings. For the full text of my motion, click here. I’m pleased to announce that, at this month’s Planning and Growth Management Committee, city staff brought forward a report recommending the purchase and installation of a device that would allow for the full audio-visual recording of Committee of Adjustment meetings. Audio-visual recordings of Committee of Adjustment panels will improve the transparency of the process by keeping a record of the meetings. The device will be installed at City Hall in January 2016. While there is a significant amount of work still to be done to overhaul the Committee of Adjustment, I’m heartened to see the realization of one of my long-standing recommendations. I look forward to seeing more improvements to the Committee of Adjustment in the near future. The Planning and Growth Management Committee also requested a report on the feasibility of live-streaming Committee of Adjustment meetings – this means you could follow the meetings from the comfort of your home. Be on the lookout for that report in 2016! As no doubt you’re aware, Toronto is facing incredible intensification pressure. That’s why I’m pleased to announce that the city is getting traction on real and significant planning reform! In my first term in office, I worked with the former Chair of the Planning and Growth Management Committee to get the establishment of a Local Appeal Body (LAB) off the ground. City Council approved the LAB in July 2014. The LAB will be an independent decision-making body that will replace the Ontario Municipal Board (OMB) in hearing appeals of minor variance and consent applications. The goal is to give Toronto more control over defining its own neighbourhoods. For example, the city, not the province, will appoint LAB members and set up the appointments process. The LAB will also determine its own rules of practice and procedure. A report from City Planning about the LAB will be coming to Executive Committee in January 2016. For more information on the LAB, check out this staff presentation from spring 2014. Toronto is experiencing unprecedented growth. While many neighbourhoods are feeling the pinch, few are experiencing levels of growth and change like the Yonge-Eglinton area. This growth has direct impacts on our built form and infrastructure – from transit to schools to stormwater management. That’s why, in July 2015, I asked the Chief Planner to report on planning tools that can be used to help manage intensification pressure in the Yonge-Eglinton neighbourhood. The goal of the study, the Yonge and Eglinton Growth, Built Form and Infrastructure Review, is to develop an evidence-based planning approach that can better inform the development review process and policy-making moving forward. From my perspective, any and all growth needs to be effectively managed to ensure the continued liveability of our community. These planning tools will guide the vision, form and fit of future developments with a focus on the context-specific character of the Yonge-Eglinton neighbourhood. Building on the recently City Council-approved Midtown in Focus, a plan focusing on public realm improvements to streets, buildings and open spaces, the Yonge and Eglinton Review is really four plans in one. Using recent growth analyses, the Review examines built form, cultural heritage, community infrastructure and transportation and municipal services. A key component of the review involves a detailed analysis of the performance and capacity of city infrastructure, including transportation networks, water, wastewater and energy. The final report will outline what infrastructural improvements would be needed based on projected growth estimates. Expected in Spring 2016, the report will enhance the development review process by providing hard data on the multiple impacts of intensification in Yonge-Eglinton. The bottom line is that we want to maintain the unique feel of the Yonge-Eglinton neighbourhood and the characteristics that make it a vibrant community. For updates on the Yonge and Eglinton Growth, Built Form and Infrastructure Review, click here. Intensification is a major issue across Ward 25. The Yonge-Eglinton area in particular is facing very significant development pressure. That’s why I moved a motion earlier this year at City Council directing the Chief Planner to report on planning tools that can be used to help manage the growth and intensification pressure in the Yonge-Eglinton neighbourhood. Click here to read my motion. I also directed staff to accelerate the built form study of the Yonge-Eglinton area. The goal of this study is to develop up-to-date policies to guide growth and maintain the neighbourhood’s quality of life. The study builds on the Midtown in Focus plan, a City Council approved strategy to improve parks, open spaces and streets. To stay up-to-date about the master plan for the Yonge-Eglinton area, click here. Residential infill construction can be a major disruption, especially for immediate neighbours and nearby homes.Late last year, I moved a motion asking for a comprehensive report on how the city can improve its response to problem construction sites. Developing a plan to effectively deal with buildings that are not built according to plan. Earlier this summer, city staff brought a work plan to the Planning and Growth Management Committee. The work plan sets out an extensive review of best practices, research and issue identification as well as ratepayer and industry consultation.You can find the work plan here. A final report is expected in fall 2015.